Jan Van Eyck was born into a prolific family of painters; he went on to become the most famous painter not only in his family but is regarded as one of the pioneers of gothic medieval art. Van Eyck’s paintings are huge, meshed in deep colors and on an epic scale. There is almost always one strong element which lurks in all of his works, religion. So refined is Van Eyck’s technique and his mysterious use of symbols that not many have been able to fully comprehend his style or copy it. Not much is known about the Flemish painters origins except that he was born into a family of painters, and apart from being a renowned painter also served as a an honorary confidante to John of Bavaria, the Count of Holland. This designation came with its share of opportunities for Van Eyck of which he took full advantage and was able to showcase some of his most brilliant pieces. Van Eyck’s paintings grace the most affluent art galleries around the world, from the National Art Gallery in London, to the Louvre in Paris and the National Gallery of Art in Washington. Van Eycks style is synonymous with the Gothic style, since most of his paintings contained religion as a subject matter Van Eyck’s art was also very grandeur. Van Eyck’s work is mostly heavy and rich oil paintings layered with carving and letters; due to Van Eyck’s schooling. 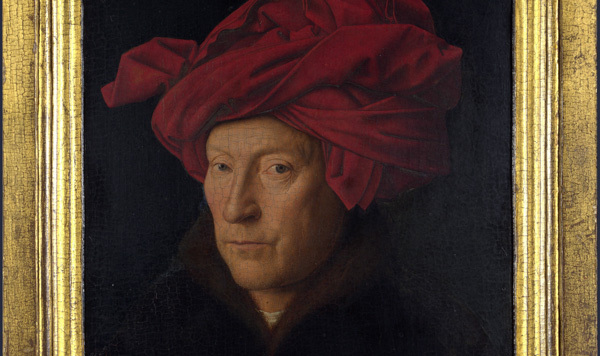 He was well educated by his family, an unusual fact amongst most painters of that era, this fact also enabled Van Eyck to get close to the Duke of Holland and gain a noble standing. Most of his works are often in scripted with his initials and date – which was another anomaly amongst artists of that time. This standing aided him in gaining further name as an artist enabling his work to be displayed at the most pristine places with a good clientele. Perhaps the most famous masterpiece of Jan Van Eycks is the Adoration of the Mystic Lamb (also known as The Ghent Altarpiece). It can still be found at the Ghent Cathedral today, surmounted at the altarpiece; the painting is simply artistic magic. The masterpiece displays Van Eycks mastery with oil paints and his sheer brilliance at embodying each figure in his painting as an individual object. The painting is huge and yet each object and figure speaks for itself. With this painting one can see why Van Eyck gained a reputation for mimicking reality and creating the effects of lights on his painting. Many artists today are in awe over how Van Eyck was able to master the technique of manipulating oil paints to his advantage, thus giving a completely different effect to his paintings. Van Eyck’s effect can also be seen in another classic of his, The Virgin and Child with Chancellor Rolin which rests today in the Louvre with various other Van Eyck pieces. In this painting Van Eyck represents what went on to be called the ‘light of day’ effect in paintings. Van Eyck was a master of manipulating oil paints to get a wider image, which enabled light to be more prominent in his painting and natural images of his painting (like trees and rocks) to have their own brilliant composition. There is a magical depth to Van Eycks paintings which remains unprecedented to this day.